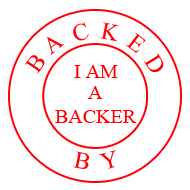 I am A Backer: ***Update Pluggy Lock Twist and GO! I don't know how I forgot to make a post for Pluggy, however better late then never. Pluggy is something many people have been looking for, whether you want something to attach the phone to your person, or you want a place to attach a charm. Pluggy is the most secure way to attach something to your mobile device. It is universal and will work on almost anything that has a headset jack( 3.5mm), iPod, mobile phones, Gameboy, iPad, etc. With just about 2hrs remaining they have blown past their funding goal. Hurry up and back them to get your hands on Pluggy before it hits the stores. If you decide to back them, please leave a comment on their campaigns comment page that you found their project through IamABacker.com , Thank you. Successfully funded! If you missed their campaign on kickstarter you can pre-order you Pluggy on their main site here pluggylock.com. I can't wait for mine and I will post up a review once I get it!